This work proposes the concept of shared presence, where we enable a user to “become” a co-located humanoid robot while still being able to use their real body to complete tasks. The user controls the robot and sees with its vision and sensors, while still maintaining awareness and use of their real body for tasks other than controlling the robot. 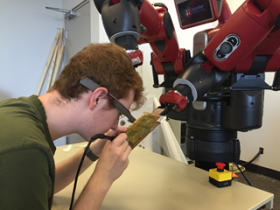 This shared presence can be used to accomplish tasks that are difficult for one person alone, for example, a robot manipulating a circuit board for easier soldering by the user, lifting and manipulating heavy or unwieldy objects together, or generally having the robot conduct and complete secondary tasks while the user focuses on the primary tasks. If people are able to overcome the cognitive difficulty of maintaining presence for both themselves and a nearby remote entity, tasks that typically require the use of two people could simply require one person assisted by a humanoid robot that they control. In this work, we explore some of the challenges of creating such a system, propose research ques-tions for shared presence, and present our initial implementation that can enable shared presence. We believe shared presence opens up a new research direction that can be applied to many fields, including manufacturing, home-assistant robotics, and education. Johann Wentzel, Daniel J. Rea, James E. Young, Ehud Sharlin, "Shared Presence and Collaboration Using a Co-Located Humanoid Robot", In Adjunct Proceedings of the 3rd ACM International Conference on Human-Agent Interaction (HAI '15). 2015.